Ilene Steinberg (third from left) and Michele Barrack (fourth from left) with their Lice Lifters staff. Two Pennsylvania women have found that it pays to be nitpickers. Literally. 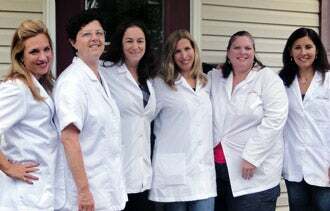 Ilene Steinberg and Michele Barrack were both in demand after each independently started her own, homegrown lice-removal business in the late 2000s and successfully removed the tiny insects and their eggs, or nits, from the heads of area families. The two women eventually met and in 2010 went into business together, opening a treatment center near Philadelphia. In less than two years, they have expanded their business, Lice Lifters, to a multistate company with eight franchisees and plans to add three more by July. "The fact that we've grown so quickly shows that there is a need," says Steinberg, who notes that they launched the business during the recession. Lice Lifters, which works with individuals, schools and camps, using a "triple threat" process, starting with the LouseBuster, a U.S. Food and Drug Administration-approved device leased from Larada Sciences of Salt Lake City. The LouseBuster, which resembles a vacuum cleaner, uses heated air rather than chemicals to kill lice and nits, dehydrating its targets. Lice Lifters technicians then follow the LouseBuster with a thorough comb-out, then finish with a light solution, akin to an oil treatment, part of the franchise's The Nit Nanny, a nontoxic product line. Lice Lifters technician uses the LouseBuster on a client. The company says the treatment has a 99.5 percent success rate. In addition, Lice Lifters says it has "cleared" more than half of the customers who came to its treatment center, meaning they were checked and found to be lice-free, without need for the remedy. Lice removal may or may not be a calling, but the business seemed to seek and find Steinberg and Barrack, who both have children. Steinberg who serves as Lice Lifters' CEO had started removing lice while working at an overnight camp owned by her pediatrician, who later referred her to a family that needed help. "I just hit ground running," she said. Steinberg dubbed her business The Nit Nanny and developed the eponymous product line. Barrack, the company's president, started her business, LiceLifters, after her own family experienced a lice problem and she saw a need for a knowledgeable treatment service in her community. The pair began adding franchisees last August, nearly a year after opening their center. Lice Lifters has franchisees in New Jersey, Pennsylvania and Connecticut, and aims to expand to Florida this summer. "We have some moms, we have some husband-wife teams, we have a single dad," says Barrack. One Pennsylvania franchisee is a former school nurse who had sent a lot of children to Lice Lifters. She retired in June and opened her franchise in August. A Lice Lifters franchising fee is $35,000, said Barrack, who notes that she and Steinberg hired an attorney after receiving several franchising inquiries. There's no build-out requirement for the franchises. The company projects revenue of more than $2 million over the next 12 months and adds that franchisor and franchisees are profitable. Larada Sciences spokeswoman Lauren Johnson says she knows of one other lice-removal service that's working on a franchise. Franchise or not, however, lice represent a thriving market. And "head-lice removal businesses are popping up all over the map," she adds. Did your business idea find you? Leave a comment and let us know.